The HTC One mini 2 will launch with Android 4.4 KitKat and HTC's latest Sense 6. The software runs snappily and feels virtually identical to the One (M8). The phone is powered by a Snapdragon 400 chipset once again, but unlike the dual-core Krait of last year, this one packs four Cortex-A7 cores at 1.2GHz. The GPU is still an Adreno 305, though considering the screen resolution had seen no change, it should be good enough. This is essentially the same chipset as the one in the Moto G and the LG G2 mini. It's nowhere near the Snapdragon 800 of the Sony Xperia Z1 Compact though. BlinkFeed is part of the homescreen (the leftmost pane) and it combines social networks and news sources into one stream. Regular-looking homescreen panes are available too. Kid Mode allows you to create restricted profiles for several children, giving each access only to several apps. Car mode is available too. It has a simplified UI, but when behind the wheel you should tap the One mini 2 with three fingers to activate voice commands. The HTC One mini 2 is no longer saddled with a stripped down version of the current One camera. True, it lacks the second camera for effects but it comes with a 13MP BSI sensor, which we consider an upgrade. The difference should be especially noticeable in daylight and with an f/2.2 aperture, it should do okay in the dark, too. The sensor is 4:3, unlike the widescreen sensor of the One (M8). The front-facing camera is a 5MP shooter with a BSI sensor, which should make the One mini 2 as good at taking selfies as the HTC One (M8). The Touch Up feature will smoothen your skin, adjust the contours of your face and remove red eye. Both cameras can record 1080p video, which is what we can expect from a device in this range. Even the mighty mini that is the Xperia Z1 Compact tops out at 1080p and for what matter, so does the One (M8). The updated HTC Zoe is on board, even though there's no dedicated Zoe mode in the camera UI. It can create Highlight videos from your photos, share them with your friends and let them add their own shots and videos with the Remix functionality. The phone has LTE connectivity, dual-band Wi-Fi a/b/g/n, Bluetooth 4.0 with aptX audio codec and NFC (which was missing on last year's model). DLNA can be used to beam multimedia to supported devices using a three finger swipe gesture. This has been a very brief encounter with the HTC One mini 2. The metal unibody offers a premium feel that is unmatched this side of the Apple/Android divide, though some of the specs don't scream flagship. When we say that we're looking mostly at the chipset as even the venerable Sony Xperia Z1 Compact (the best equipped mini around) comes with only 720p screen resolution. Still, this chipset fared quite well in the Moto G and LG deemed it good enough for its own mini, the LG G2 mini. The 13MP camera is a major update, maybe it can't compete with Sony's 20MP shooter, but the One (M8) camera felt like a letdown and this is HTC's chance to redeem itself. The addition of a microSD card slot is another thing people will be happy about. 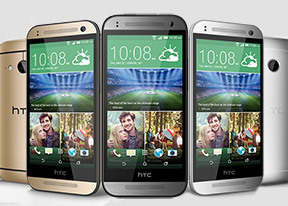 The HTC One mini 2 is a prized addition to Android's mini lineup. The "mini" moniker will certainly come under fire though - not because of the 4.5" screen but because of the height. Is it worth it though? After all width and thickness are usually bigger considerations when it comes to handling, but we shouldn't forget that the power button on this one is still placed on the top. Well, you can see we've got a lot of burning question to answer in our full review. Stay tuned!